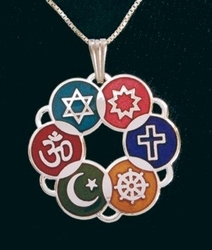 Large Interfaith Pendant (Silver-plated or Multicolor) NEW! 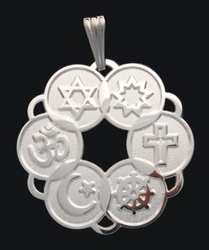 This classic Interfaith Pendant is silver-plated and measures 1 and 1/8" in diameter. It comes without a chain so you can use the favorite one you already have! Two versions available..... You can choose between either the silver-plated or multicolored with silver-plated backing versions. Pick one and buy the other for a friend.